Clint Eastwood and Billy Curtis in High Plains Drifter. With High Plains Drifter (1972), second-time director Clint Eastwood brought his "Man with No Name" to American soil, from the Spanish locations where his Spaghetti Westerns were shot. Set in the soul-less town of Lago, the stark plains landscape is brilliantly set off by a clear blue lake, a tantalizing promise of beauty. As in his later film Pale Rider, the movie hints that this Stranger may actually be a dead man returned to avenge his own murder. This film takes the cynicism of Vietnam-era Westerns a step further: not only is there little difference between the law and the bad guys, but the "good, decent people" do not appear deserving to be saved. In their silence and passivity, they are as guilty as anyone. The approaching outlaws are in many ways a McGuffin. The Stranger's true adversaries are the townspeople--who simplistically reward the Stranger for his opening slaughter of their hired guns by hiring him as their savior. The Stranger uses the town's fear and guilt to manipulate and humiliate them. Sergio Leone is not the only Italian director whose influence is apparent in this film: the Stranger turns the town into a Fellini-esque carnival, setting up a midget as mayor and sheriff. The lengths to which the town will submit to avoid the retribution that they deserve turns this Western into a dark farce. The eerie score by Dee Barton works with the dark flashbacks to hang an ominous shadow over the townspeople’s comical interactions. The supporting cast includes Billy Curtis as the Stranger’s protege Mordecai, Verna Bloom as the object of the Stranger's rather perverse affections, and Mitch Ryan (Dharma & Greg) as the manager of a mine--the source of Lago’s livelihood. Frequent Eastwood costar Geoffrey Lewis (Thunderbolt and Lightfoot, Bronco Billy, and Every Which Way But Loose) plays Stacey Bridges, the leader of the trio who've vowed to burn the town to the ground for framing them and sending them to jail. As the former hired guns of this fickle town, these men are shown in flashback as having whipped to death a young marshal--as the "decent folk" looked on. Though Westerns often show the injury and recuperation of the hero as an essential step toward his triumph, this film goes further by showing the humiliating death of an inadequate lawman who is then "reincarnated" into an imposing and seemingly omnipotent torturer. Instead of linking this film to earlier Westerns, High Plains Drifter may actually be more significant as a bridge to Vietnam films like First Blood (Ted Kotcheff, 1983) that display the powerful rage of the abused and discarded hero. 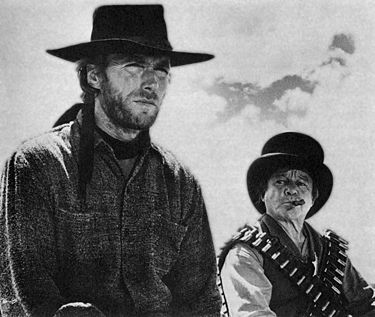 This film serves as an important transition in Eastwood’s career as an actor and director, building on the recognition that he received internationally through Leone. Secondly, this film serves to integrate Leone’s styles and themes into American post-Vietnam films--Westerns and non-Westerns alike.